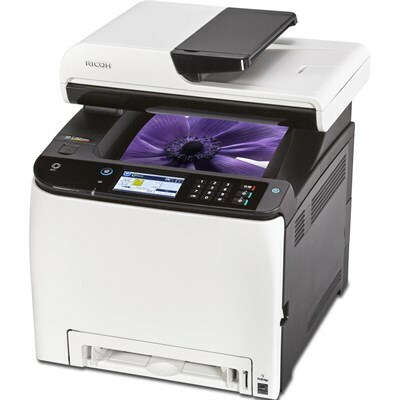 The 21 page-per-minute (ppm) RICOH SP C262SFNw Color Laser Multifunction Printer (MFP) optimizes printing, faxing, scanning and copying so small companies can communicate more efficiently. This compact device delivers big results - including increased productivity and professional-quality color copies and prints that will impress both your customers and coworkers. Plus, it fits easily on home-office desks, under retail registers and hotel front desks, and on side desks in office reception areas. The high-performance processor of the SP C262SFNw lets you increase productivity by performing tasks more efficiently. Multiple users can send jobs to the device simultaneously and process them quickly with 21-ppm output. Plus, when you're in a hurry, recovery time of less than 30 seconds and a first-print time of about 14 seconds will have your device ready to go quickly. With multiple connectivity options, including Ethernet and standard wireless, you can connect your MFP in a way that fits your company's work style. Plus, with the Near Field Communication (NFC) tag on the front of your MFP, you can work faster by printing via the RICOH Smart Device Connector app or scanning with the RICOH SP C260 series scan app - simply tap the NFC tag with your phone and select a file to print or scan. The SP C262SFNw is priced competitively, and with color toners that can yield up to 6,000 pages, it has a low average cost per page - this translates to big savings over the long run. Plus, with ENERGY STAR certification and an EPEAT Silver rating, you'll enjoy a small carbon footprint and reduced energy costs, lowering your total cost of ownership (TCO) even more. Get more buy-in at company meetings - and when pitching to customers - with high-quality color materials. Add colorful company logos to letters and proposals for a more professional look. You can use a variety of paper stock, including letter- and legal-size documents, envelopes and more. Plus, with optional paper trays, you can reload paper less often with up to 751-sheet capacity. Standard security features help you safeguard data and further reduce TCO. User codes let you manage user access to specific functions, such as restricting color printing to help lower toner costs. With Locked Print, you can have users authenticate at the device to reduce paper consumption and help ensure documents aren't left unattended. Supported Paper Sizes - Paper Tray: 5.5" x 8.5" x 14"; Bypass Tray: 3.54" x 5.83" to 8.5" x 14"
Scan Area - Up to 8.5" x 11"
Acceptable Paper Size: 5.5" x 8.5" - 8.46" x 14.0"